She’s searching for answers to her past. They’re hunting her to save their future. World War III has left the world ravaged by nuclear radiation. A lucky few escaped to the Alaskan wilderness. They've survived for the last thirty years by living off the land, being one with nature, and hiding from whoever else might still be out there. At least, this is what Juneau has been told her entire life. When Juneau returns from a hunting trip to discover that everyone in her clan has vanished, she sets off to find them. Leaving the boundaries of their land for the very first time, she learns something horrifying: There never was a war. Cities were never destroyed. The world is intact. Everything was a lie. Now Juneau is adrift in a modern-day world she never knew existed. But while she's trying to find a way to rescue her friends and family, someone else is looking for her. Someone who knows the extraordinary truth about the secrets of her past. After the End, the first book in a series written by Amy Plum is about what happens after World War III in 1984. Interesting, right? Well, I was intrigued with the plot and Plum’s story did not disappoint. I was intrigued about the fact that this community thrived for about thirty years in the Alaskan wilderness without anyone finding about them. Or, even without the other people in the settlement finding out about the real world. The heroine Juneau has grown up in a small commune at the foot of the Denali mountains in Alaska after the third World War. Unbeknownst to her, the elders in the community have been keeping a secret from them – there was no World War and that they were hidden in Alaska as test subjects. When Juneau comes home after a hunt and discovers everyone in the commune missing, all their dogs slaughtered, she discovers how much the elders have hidden from them. The alternating voice of the hero Miles and the heroine Juneau, was perfect. I liked listening to the characters’ inner thoughts which helped in setting the scene. Miles’ voice felt believable and age appropriate. He was 18 years old and he sounded like an 18 year old. Juneau, who was 17 sounded like a naïve 17 year old (because of how she grew up) was well done. The characters were well fleshed out. I felt that everything each character did was important to the plot. I didn’t feel that there was a lot of fluff in the story. There was enough intrigue to keep me wanting to know more about Amrit. The narrators were perfect. Graham Hamilton did a superb Miles and I felt his voice was age appropriate and helped add character to Miles. Emily Rankin voiced Juneau and I thought she also did a superb job. Loved the snips of humor throughout the book (see quote above). Those were the highlight of reading this book, and Miles’ sarcasm was perfect! The mystery about the magic kept me entertained. I wanted to know more about the experimental drug that they were formulating, and the power that it seemed to cause. The first few chapters were unbelievable. Well, in Juneau’s case since it seemed like she knew what to do when in fact she had been raised in a community separate from the modern world. Sure, they knew things from the Encyclopedia Britannica but still, everything that she did felt too convenient. The book was a slow start for me (see comment above). If this wasn’t an audiobook, I probably would have, no, I would have stopped reading the book altogether. Nothing happens throughout the book. It was basically a road trip, with baddies following both Miles and Juneau. There wasn’t a good amount of action for the most part. 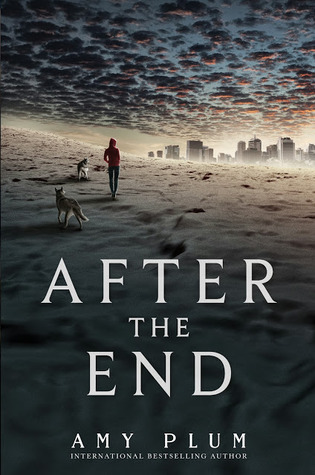 After the End is a journey of self-discovery for Juneau and Miles. And although nothing exciting happens throughout the book, I love the pacing, snark, sarcasm, and humor.